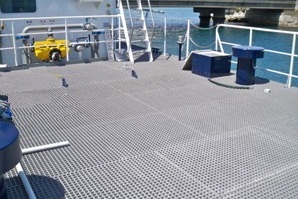 Background - A challenge was set to create an anti-slip surface on a work vessel. 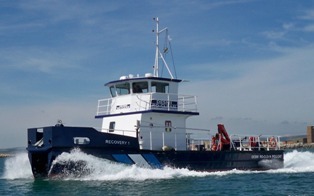 Project - Our client who build and repair large work vessels asked us to re-surface one of their ships with our marina grade mini mesh to make it safe for the crew to move around. 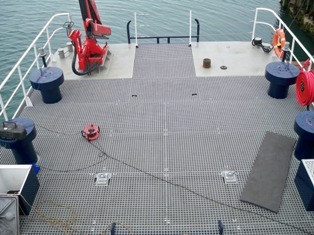 The Solution - We accepted the challenge and our fabricators and installers came through and successfully fitted the mesh. 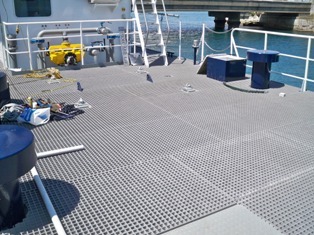 The ship is used in the harshest of weathers with salt water covering the deck at times but the GRP mesh is perfectly suited to this and remains sturdy and anti-slip.